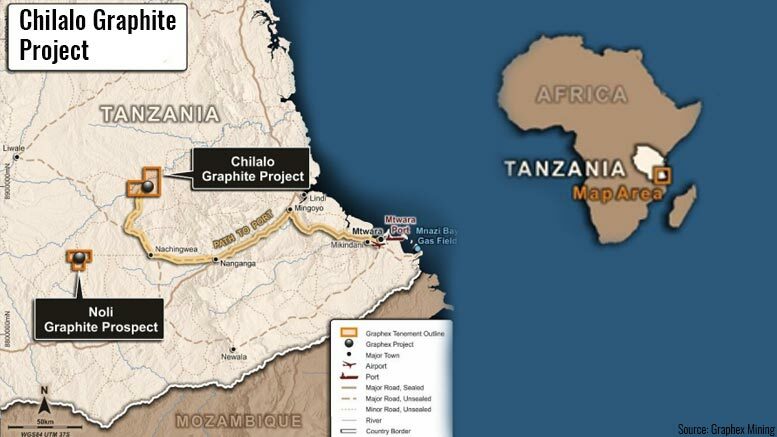 The Tanzanian Ministry of Energy and Minerals recently granted a 10-year mining license to Australian resource company Graphex Mining (ASX:GPX) for the Chilalo graphite project in south east Tanzania. The mining license has been granted for a period of 10 years and covers an area of 10sq. km (the Shimba graphite deposit at Chilalo). The Chilalo graphite project is located in south east Tanzania, within the Mozambique belt, which is well known for hosting some of the world’s highest grade and coarse flake graphite deposits. Average annual production is expected to be 69,000t of graphite concentrate over 10 years. Graphex indicates that the Shimba deposit has a total resource (indicated and inferred) of 25.1m t; however, after a recent drilling program, Graphex has identified a new mineralized zone 200–300 meters north of Shimba. Accordingly, this will underpin an increase in the Shimba mineral resource estimate, which is expected to be announced in the near future, Graphex notes.